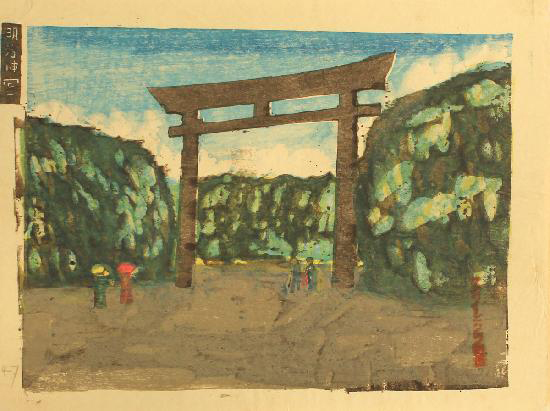 This is the second article in a series about the artists of the sosaku hanga (creative prints) movement which took place in Japan during the early-to-mid 20th century. 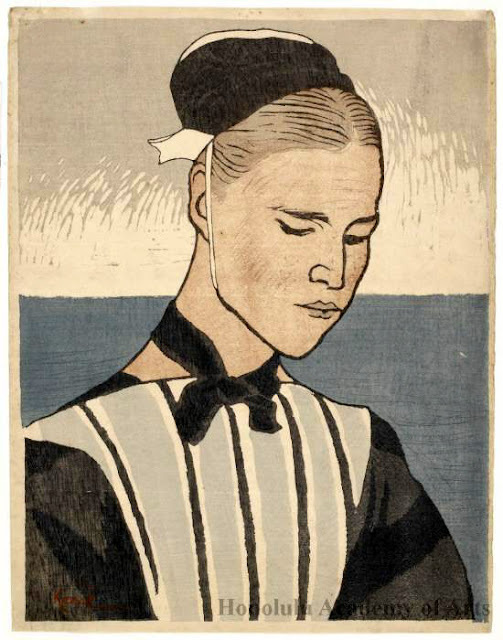 Artists involved in this movement held to the idea that for a woodblock print to be considered “art” rather than a commercial print, each step (design, carving, and printing) needed to be carried out solely by the artist rather than by separate artisans. 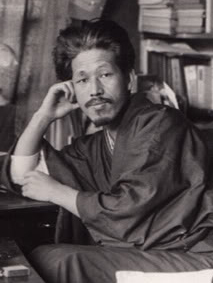 According to Oliver Statler, Koshiro Onchi (1891-1955) could be called a rebel. Raised in a conservative upper class family who expected him to be a doctor, Onchi rebelled by entering art school. His approach in art school was to do whatever he wanted, and he was subsequently invited to leave. 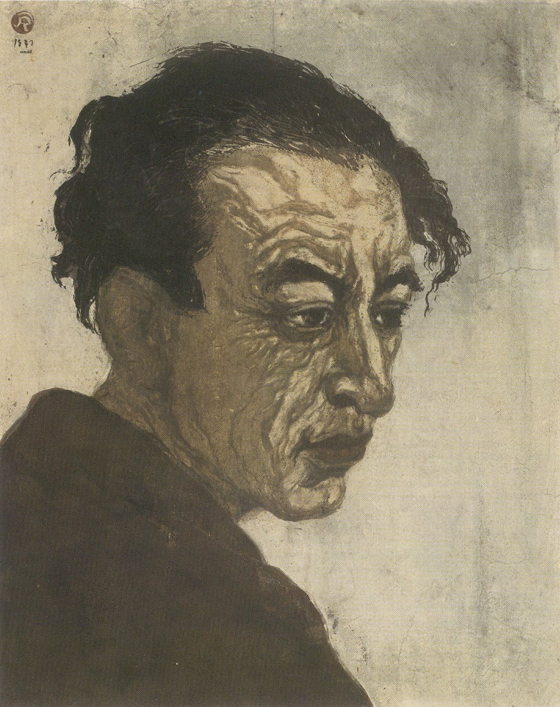 Once on his own, Onchi continued his rebellion by abandoning the oil painting he had studied and, influenced by both Yamamoto and the work of Europeans like Kandinsky and Munch, he threw his oppositional energy into the sosaku hanga movement. Hanga was a perfect art form for Onchi's fighting spirit, as the Japanese art world of the time was strongly against accepting hanga in shows and competitions. Like most of the sosaku artists, Onchi supported himself by doing commercial work. He had studied calligraphy in his youth, and after art school he got involved in magazine and book design, with a special interest in art and literary magazines. By the mid-1920s he came to be known as one of Japan's foremost book designers. There are several good online articles about Onchi. My friend Gerrie did a nice overview last fall on the Linosaurus blog, and there's a lot of good biographical information on the Lavenberg Collection web site. 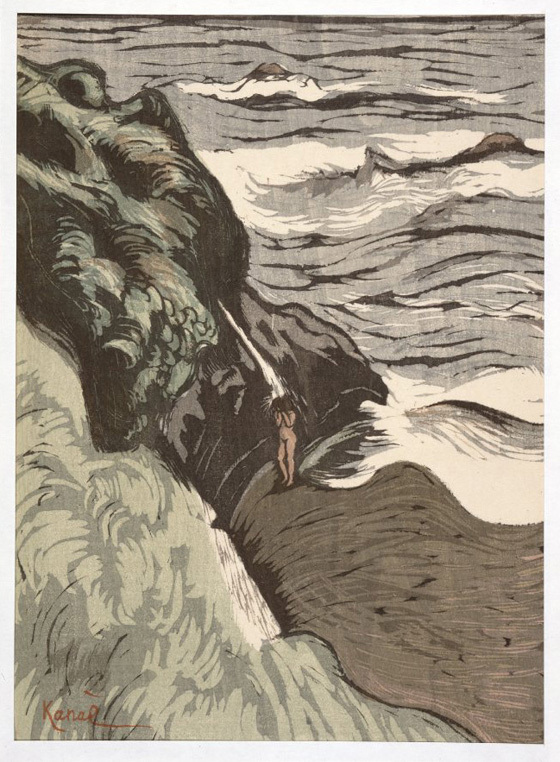 As a mokuhanga printmaker, my main interests for this post are Onchi's techniques and his thoughts about hanga. One of the first things I notice about Onchi's style is that it's all over the place. He could render figurative prints in great and gorgeous detail, as you can see from the following example. I can barely believe that this portrait is a woodblock print, but it is. Onchi was clearly capable of beautiful draftsmanship and careful printing. 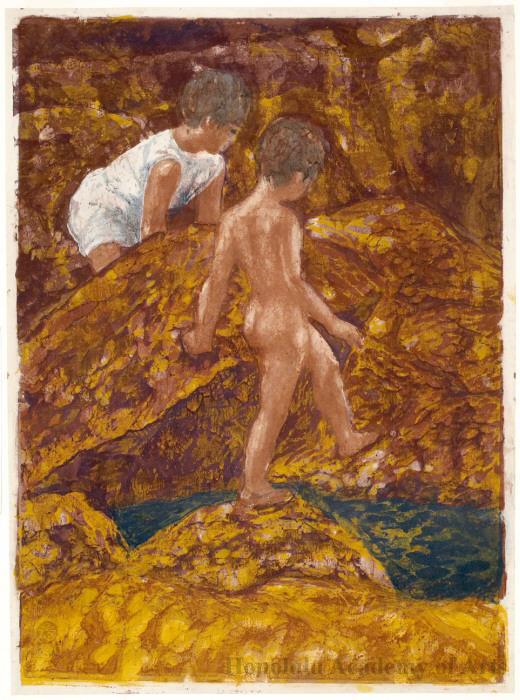 And yet, his representational prints are often somewhat crude and messily printed. Look especially at the margins in the examples below, both of which come from a subscription series of prints made between 1928 and 1932 called 100 Views of New Tokyo. I'm fascinated by the sloppiness, probably because I find it difficult to allow my own work to be sloppy, so I'm jealous of Onchi's cavalier attitude. 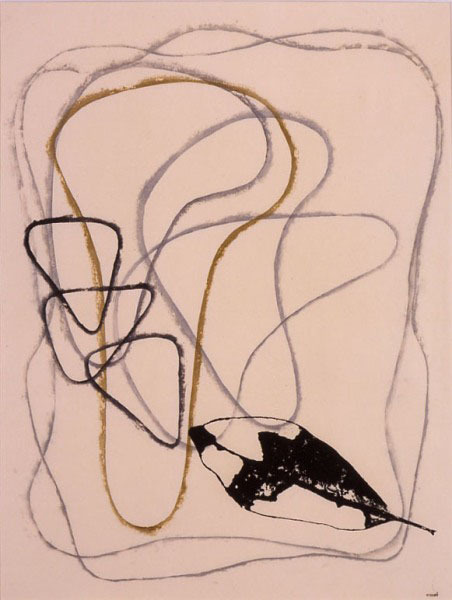 Onchi came to believe that hanga was uniquely suited for abstract art, and as time went on he moved more and more in that direction. 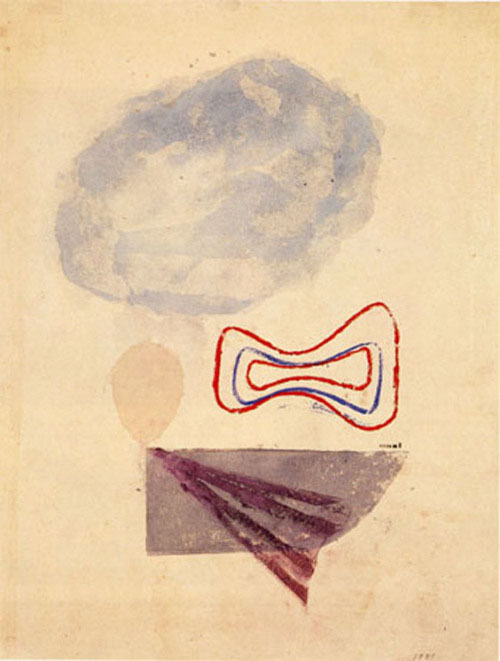 In his abstract work, Onchi was relentlessly experimental, constantly trying new techniques and materials. In addition to wood blocks, he printed with paper, cardboard, string, objects, leaves — anything that caught his imagination. 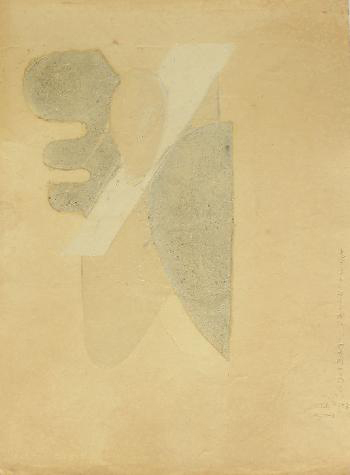 The forms in the print above, Leaf and Clouds, were cut from waxed paper. For each impression he brushed the waxed paper form with regular sumi ink and some nori, putting most of the ink near the edges, then laid the form onto a piece of glass with the inked side down. The printing paper was placed on top of that and he used his baren as usual, allowing the ink to ooze out from under the waxed paper. The leaf shape was printed from a leaf. 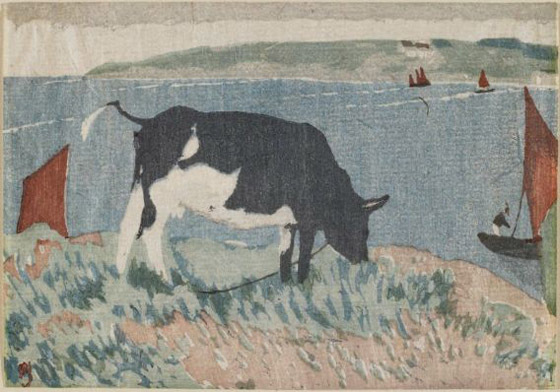 Onchi's portfolio prints were printed in larger editions, but many of his abstract prints were done in very small editions of 5 or fewer, making them more like paintings than prints. I can relate to not wanting to make big editions. I'm not so crazy about Onchi's abstracts, but I enjoy his figurative work and I love his rebellious and experimental spirit. 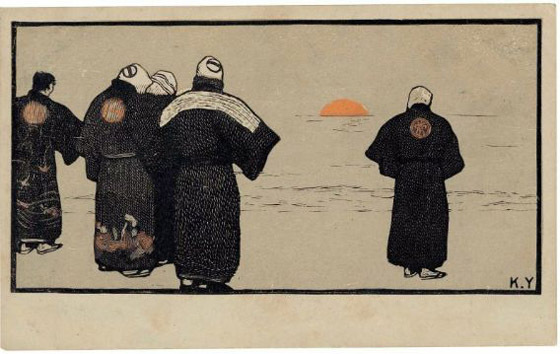 Yamamoto, from "Modern Japanese Prints"
This post is the first in a series about the artists of the sosaku hanga (creative prints) movement which took place in Japan during the early-to-mid 20th century. 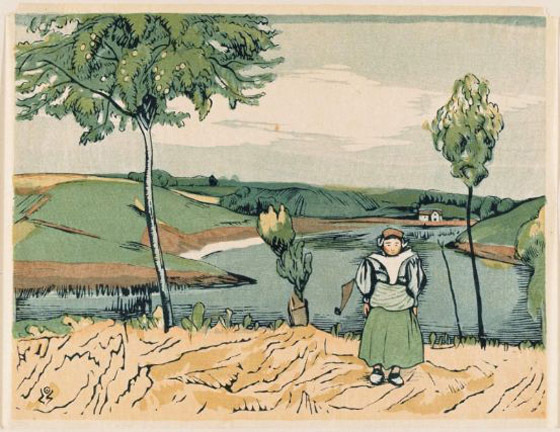 Artists involved in this movement held to the idea that for a woodblock print to be considered “art” rather than a commercial print, each step (design, carving, and printing) needed to be carried out solely by the artist rather than by separate artisans. Kanae Yamamoto (1882-1946) is often called the founder of sosaku hanga. At age 11, he was apprenticed to a wood engraver and after his apprenticeship he worked as a newspaper engraver/illustrator. 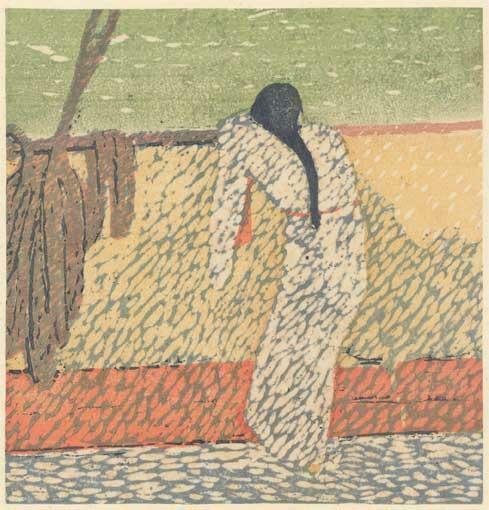 At age 21 he entered art school and in 1904 he made what is considered the first sosaku hanga print, called Fisherman. By the time he graduated from art school, Yamamoto was deeply excited about creative woodprints and he became an influence on many other artists. As you can see, this two-color print is carved in the style of an engraving although, unlike an engraving, it was made on a plank board and the chisel marks are fairly loose. At the time the print was published in a Tokyo magazine, it was labeled as a toga, literally a “knife picture.” I kind of like that term. In 1912 Yamamoto went to Europe for several years and further developed his style, which became looser and more oriented toward the u-gouge like the German expressionists. The chisel marks are what stand out to me in these prints, as well as the European subject matter. Once back in Japan, Yamamoto started a sosaku hanga organization which lasted many decades, and he also started and ran an arts and crafts school in the mountains of Nagano Prefecture. The school, which took Yamamoto away from pursuit of his own art, was never a great success, but it birthed another movement in Japan called the "Free Drawing" movement. This movement in childhood education argued against the old copying method of learning to draw and encouraged freedom and creativity in children's expression. After the school failed, Yamamoto returned to Tokyo determined to take up his own artistic practice again, but he suffered a cerebral hemorrhage shortly afterward and died in 1946 at the age of 64. Before his death, Yamamoto got out of bed and took a hatchet to his wood blocks. As Oliver Statler writes, "For a man who believed so deeply in creative prints it must have been anathema that somebody else might print from his blocks." Back in 2005 when I first started making Japanese style woodblock prints, I took a trip to Japan and while I was there I saw an exhibition called “The Warmth of Woodblock Prints” which featured prints from the sosaku hanga (creative prints) movement of mid-20th century Japan. There were over 150 gorgeous prints and I spent hours there. 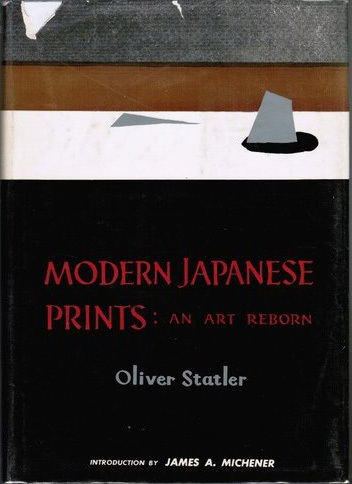 A few months later, Australian woodblock artist Tom Kristensen told me about a book called Modern Japanese Prints: An Art Reborn by Oliver Statler which charts the history of the sosaku hanga movement. The book, which is now out of print, was written in 1959, a time when the movement was still developing and when it had few advocates even in Japan, and it is notable for the intimacy of the interviews that Statler conducted with over 25 sosaku hanga artists, often in their studios and homes. I immediately bought a copy and read it cover to cover. My recent visit to Smith College’s “Collecting the Art of Asia” exhibition where I saw a number of sosaku hanga works reminded me of Statler's book, so I picked it back up again this week and have started reading it for a second time. What I find these 8 years later is that the book has much more meaning to me now that I have more experience with the techniques of Japanese woodblock printmaking. So I plan to do a series of blog posts about some of these artists as I go through the book again. In the next post I’ll begin with Kanae Yamamoto who is often called the founder of sosaku hanga. Smith College Museum of Art (SCMA) in Northampton, Massachusetts, has a show up right now (through May 26, 2013) called “Collecting the Art of Asia” that should be of interest to printmakers, especially those working with woodblock/mokuhanga. The exhibition, which highlights the Museum's holdings of Asian art, includes one large room (shown above) dedicated to prints by artists from Japan, China, Korea, and Pakistan created between 1950 and the present day. I present here a few of the Japanese prints I saw at SCMA. Most of the Japanese prints come from the 20th century sosaku hanga movement, which is distinct from traditional Japanese woodblock. 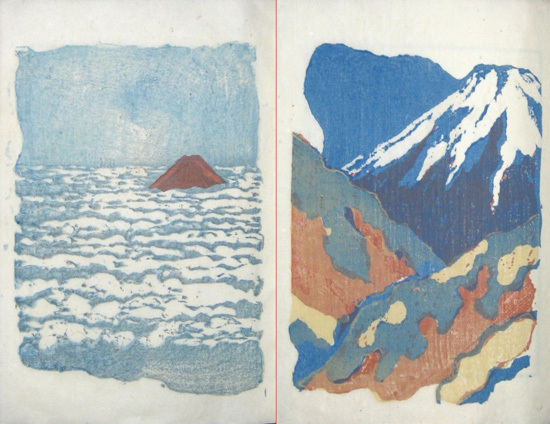 Whereas in traditional woodblock three different artisans do the three different aspects of making the print—designing, carving, and printing—the sosaku artist does all three. I would venture to say that an artist who can do all three of these tasks with equal skill is very rare. Most woodblock printers that I know love one or another of these tasks more than the others and are usually better at that one. 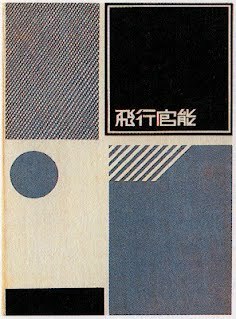 Kiyoshi Saito loved design and composition the best. This print was the favorite at the exhibit for both me and my partner Lynn who came with me. Lynn, in fact, choked up in front of it, a testament to the print's power to evoke a mood. Saito is one of the Japanese sosaku (creative) artists who I most admire, and I had never seen this particular iteration (#5) of a favorite topic of his, Aizu in winter. These black and white prints, made in the 1940s, depict scenes from his childhood home of Aizu, located in Fukushima Prefecture in Japan. 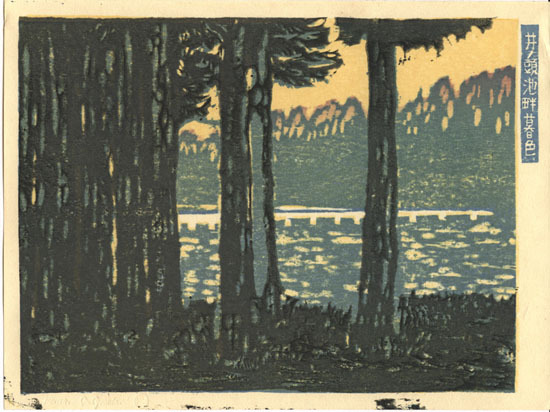 For me, the balance of the various gray tones, the composition, and the many textures that Saito coaxes out of the wood and the water-borne inks all inspire and instruct me as a printmaker. If I had produced this print myself, I would have laid down my tools and taken a rest. For me, the joy of making a print is not in working with the materials but in creating the design… When I'm trying for a new or complicated effect I have to do the work myself even though I don't especially enjoy it. I'm amused—and a little annoyed—by people who talk about some of my effects as though they were happy accidents. These people seem to think we modern artists let our medium control us. I scheme and work and sweat over my prints. 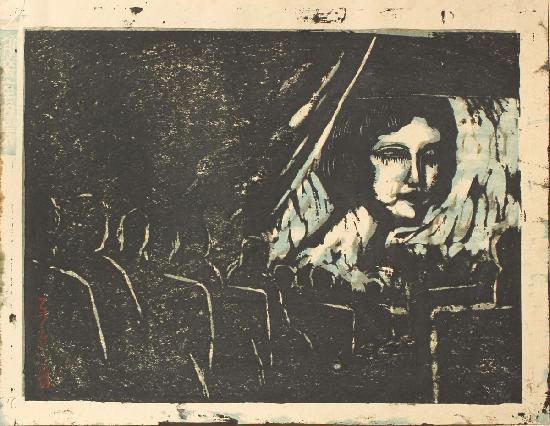 Making a woodcut is much too strenuous to let accidents determine results. 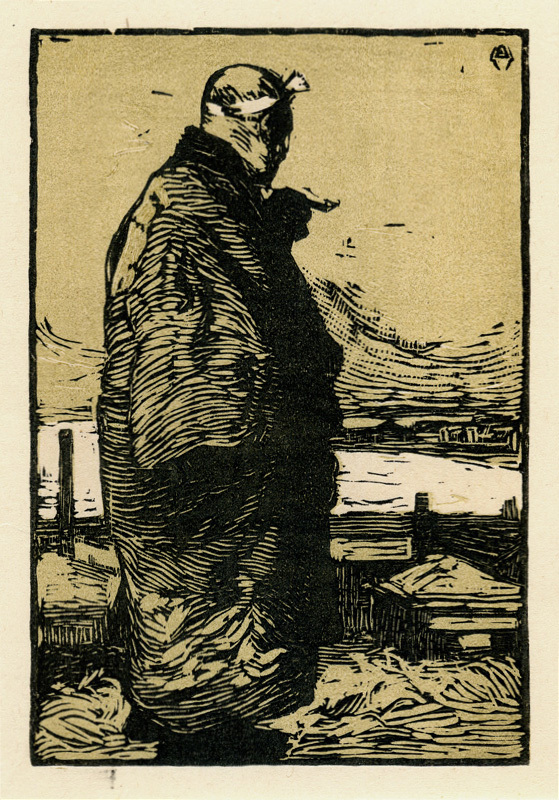 A recent acquisition at SCMA is a well-known print by Jun'ichiro Sekino, a portrait of his mentor Koshiro Onchi. I've never seen this print anywhere but on the internet, and I assumed it was much smaller than it is. 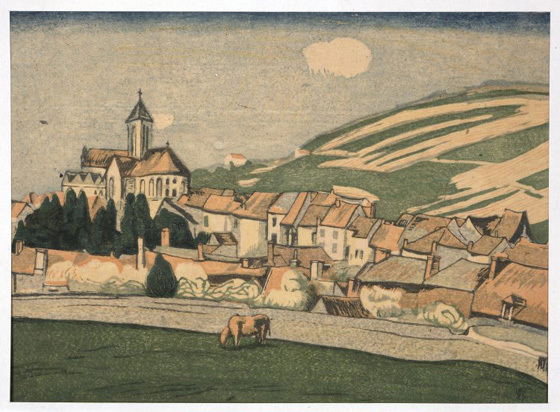 Unlike Saito, who disliked the drudgery of printmaking, Sekino seemed to love it. His portrait prints, like this one, are masterpieces of technique. Unlike Saito’s prints, I can’t mentally deconstruct these into their component blocks. Hidehiko Goto is a printmaker who is also one of a very few professional baren makers in Japan. (A baren is a flat bamboo-covered disk that is used to transfer ink from block to paper to make a print.) Goto's print work focuses on texture and composition. Ansei Uchima (1921-2000) was a Japanese-American artist who was introduced to sosaku hanga through his job as a translator for Oliver Statler. 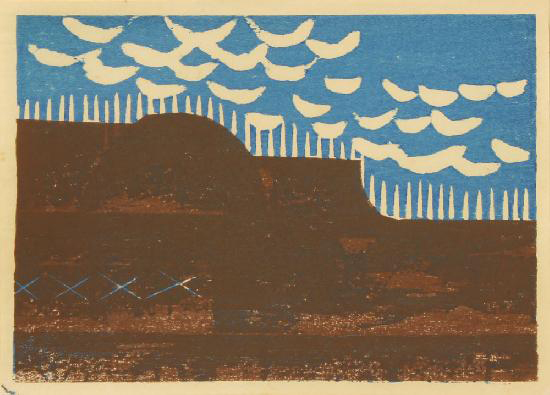 Unlike Saito, Uchima loved the “happy accidents” of printmaking and used them to great advantage. 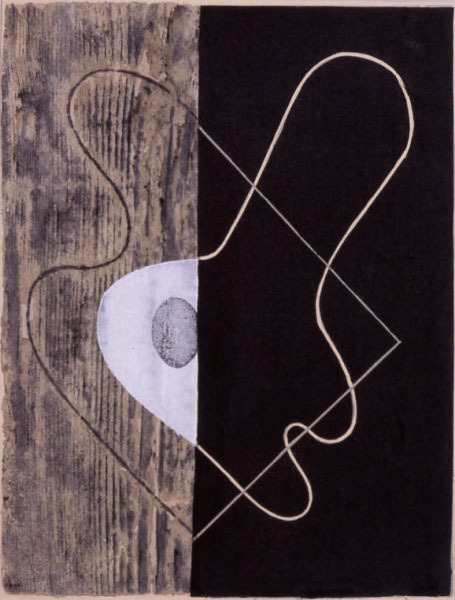 His prints are abstract and experimental. There are many other beautiful objects at SCMA’s “Collecting the Art of Asia,” such as this rattan Buddha sculpture by Cambodian artist Sopheap Pich. If you're in the area, I recommend a visit to see this exhibit, up through May 26, 2013.